Welcome to Lake Placid Adult Figure Skating! Our June weekend will begin on Thursday night with a welcome party and warm-up skating session, while the August week will kick off on Sunday night. After that, it’s full swing ahead with sessions and classes from morning until night. Generally, we offer at least 6 hours of on-ice sessions and 10 on-ice classes per day. 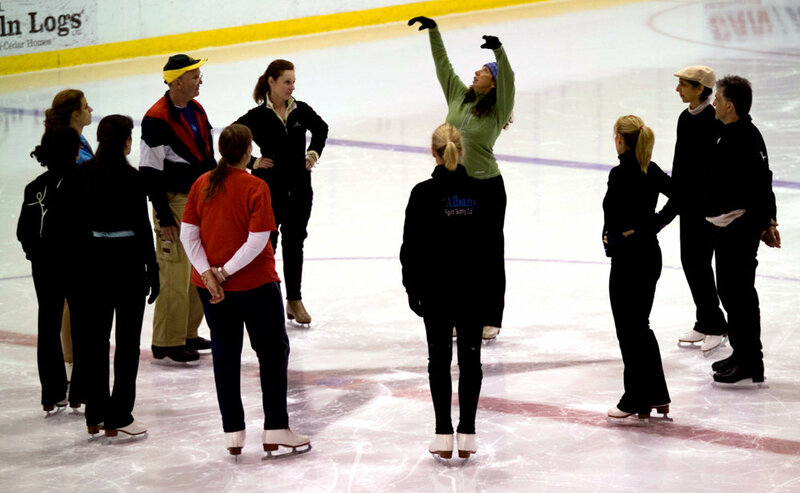 On-ice classes cover all aspects of skating such as basic skating technique, turns, jumps, spins, ice dance technique and movement. Times are based on ice and instructor availability. Several off-ice group classes are also available. Off-ice classes may include yoga, ballet, zumba, fitness, stretch and trampoline. Lake Placid is a popular destination - especially in the summer! Make sure to reserve your housing as soon as you decide on the dates you would like to attend. While it is not a requirement, most skaters work with a private coach while they are here. You can find a list of coaches by clicking here. All of our coaches are independent contractors, so coaching arrangements should be made directly with the coach. If you aren’t sure who to work with, we recommend first asking your current coach at home. However, you can always contact us with any questions! You must pre-register online for the programs in which you are participating. At this time, you are only registering for the program which includes your ice time. You are NOT registering for classes. Please register at least TWO WEEKS prior to your first week so that we have everything ready for you when you get here and so that you receive the informational e-mail approximately one week prior to your arrival. On site registrations are subject to an on-site registration late fee. Ice sessions are generally 50 minutes in length. Most sessions are designated as “Open Adult” meaning that you are able to practice any discipline on that session - freestyle, ice dance, moves in the field, etc.. Other sessions may be designated as “Patch” meaning only figures are allowed on that session or “Ice Dance” meaning only ice dance is allowed on that session. Any of these sessions are included with your registration on that days that you registered for. On-ice and off-ice group classes are also available. You do not have to pre-register for these classes, simply purchase a ticket for them at the Box Office before the class. A tentative schedule of classes will be e-mailed to you approximately one week prior to your arrival. A final class schedule will be available when you check in. Registration Fee: All programs require a $50 non-refundable registration fee. On-Site Late Fee: A $25 on-site registration fee will be assessed if registering on-site. There will be no refunds on lockers, testing, extra ice cards or harness cards. Refunds will only be given for unused lesson tickets, on-ice and off-ice classes and ice time when the skater misses two or more weeks of continuous ice time due to a documented medical reason. Refund requests must be made in writing to the Arena Office with a doctor's note attached by September 1, 2019. Refunds are subject to a 15% filing fee and take 4-6 weeks to process. Please note: THERE ARE NO REFUNDS FOR LOST OR STOLEN LESSON TICKETS. THEY ARE TREATED LIKE CASH. "Love love love coming to Adult Week! Coaches are the very best, so encouraging, so talented. Very pleased with the effort to make us feel welcome. Ice was exceptional." Rosemary G.
"Love the camaraderie, the support from everyone, skaters and coaches, Love Lake Placid - the views of the lake and mountains - and the people- everyone is friendly and makes you feel welcome." Ingrid B. "The Lake Placid Experience is Awesome!" Grace D.